bpmurray and OhDark30 like this. Dang, im speechless at this ebay set. Sadly not in a position to buy but the $400- pricetag is very reasonable. Edit now for $300 or bid from $225! NuttySlack, elsoldemayo and oldfox like this. Seller claims this is a "ussr watch" but the dial clearly says "made in Russia". This must be a post-USSR example. 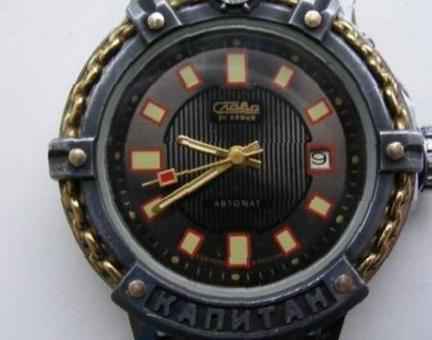 Maybe someone else can comment but my impression was the USSR-era Slava diver was the more collectable example. Great catch! There are quite a few differences (automatic vs. hand-wound; dial textured vs. matte). I would argue the *only* example. Is there evidence that this "Made in Russia" style is legitimate? I've seen it a few times, but it's always struck me as looking like a Soviet-era Slava Amphibia with a post-Soviet Kapitan dial and movement. I have read that this is the easiest way to "restore" an original Slava Amphibia when the original dial is badly abused or missing.